On Monday April 20, 2015, our owner, Eddie White, became certified in the WillowWood One System. This new technology offers a transfemoral solution for vacuum suspension. "The WillowWood One System provides a consistently secure, comfortable and straightforward vacuum solution for transfemoral amputees with no hoses, sleeves, or extra bulk required. 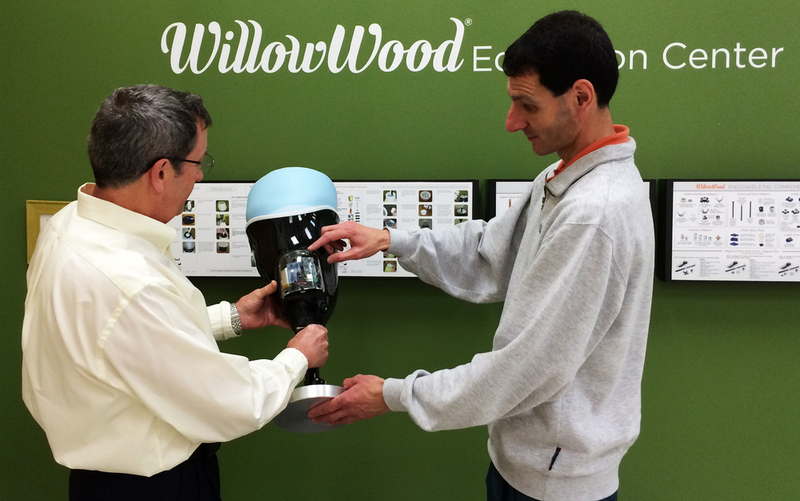 The WillowWood One System was initiated through a grant from the Veterans Administration that covered 26 months of development and testing and included over 40 clinical test patients of various activity levels. The purpose of the grant was to a develop a new socket system for transfemoral amputees that was comfortable, controlled pistoning, reduced sweating, allowed for a comfortable walking gait, and monitored and responded to activity levels of the wearer. The resulting system meets all these criteria while remaining easy to don and doff and providing unparalleled comfort and security. During clinical testing, amputees repeatedly commented that they could put the system on at the start of their day and no longer needed to adjust their sockets repeatedly throughout their day. The second overwhelmingly reported feedback was that the airtight seal of the system did not break. Amputees could comfortably move (transition from sitting to standing, walk, run, ride a bicycle or motorcycle) with maintained vacuum, and did not experience any movement of the socket."